With unemployment rates on a too-slow decline, one can never be too content with one's current job situation—not even a future NBA Hall of Famer who is the "CEO, President at Alot of different companies. Inc."
That's right: Shaquille O'Neal has a LinkedIn profile, which New York's Daily News has confirmed is the former NBA center's actual page. Shaq is interested in being contacted for career opportunities and getting back in touch. 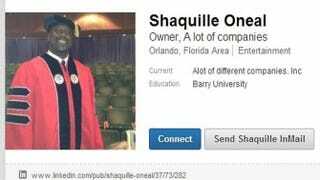 According to the profile, the "Big Aristotle's" education history includes a bachelor's from LSU, an M.B.A. from the University of Phoenix and an Ed.D. from Barry University. In addition to being the "CEO, President at Alot of different companies. Inc.," Shaq is interested in "working on a lot of different ventures." He describes his best asset as "proven to lead teams to championships. I mean multiple championships."